We know it’s coming, we just don’t know when. It makes no sense — and that’s exactly why we should be on our guard. Because we can’t wish it away — and we can’t — we’ll do our best to ignore it, but at our peril. It’s going to be ugly. How could it be anything but? All the more reason we should be bracing for the day that Prime Minister Stephen Harper turns his attention from the Chief Justice of the Supreme Court to focus on hockey and, specifically, the urgent business of reducing it to a smoking ruin. Stop in at www.conservative.ca and you’ll find a passion for hockey listed under 10 THINGS YOU MIGHT NOT KNOW ABOUT PRIME MINISTER STEPHEN HARPER, but it’s never been a secret, has it? That he’s learning to speak Spanish, used to collect coins, and “owns numerous atlases:” that counts as news. “A consummate hockey dad, he can often be seen cheering Ben on at local rinks or joining his son in the stands for the occasional NHL match-up:” not so much. He published A Great Game, after all, in the fall, a study of antique Toronto hockey arcana, and for anybody who’s saving it up for the beach this summer, here’s the takeaway: denying Mr. Harper’s love for the game would as ridiculous as doubting Riddy Ridpath’s significance to the rise of the Toronto Professionals in 1906. Still, this is politics, where everything’s written in ice. That deficit you were never going to run? You do what you have to do. A prime minister’s enthusiasms thaw, too. Am I right, Accountability Act? The thing about governing is, there’s no slowing down. Scuttled the National Roundtable on the Economy and The Environment? Great. Bombarded the Parliamentary Budget Office? Congratulations. Backed up the bus far enough to knock down Mike Duffy, Nigel Wright, Neil Young, the public service, and the CBC? Nice driving. What’s next? I think we all know how it’s going to start. On a Friday afternoon, late, in an 800-page omnibus bill called Creating Jobs & Growth While Granting The Beatles Canadian Citizenship & Returning to Balanced Budgets & Yay For The War of 1812. Buried deep within its pages, look for several dense paragraphs halving the size of the puck and eliminating left-wingers. Next up, over the weekend: a series of attack ads will go after Senators Frank Mahovlich and Jacques Demers, casting doubt on all those Stanley Cups they allegedly won. Monday morning Pierre Poilievre will be front and centre, taking swipes at Sidney Crosby’s lack of playoff scoring, Carey Price’s rebound control, and Chicago’s zone-entries, all based on taxpayers needing to know whoever elected any of them to anything, anyway? Joe Oliver will be the one to raise the red flag on foreign money flooding the game. He’ll announce new money for audits of special interest groups, starting with the Boston Bruins. When Bobby Orr and Jean Béliveau speak up for the game they hold dear, look for Tony Clement to dismiss them as self-appointed experts. Also, referees: Mr. Poilievre will resurface to explain why they should not be wearing team sweaters, or stripes or —really — any clothes at all. 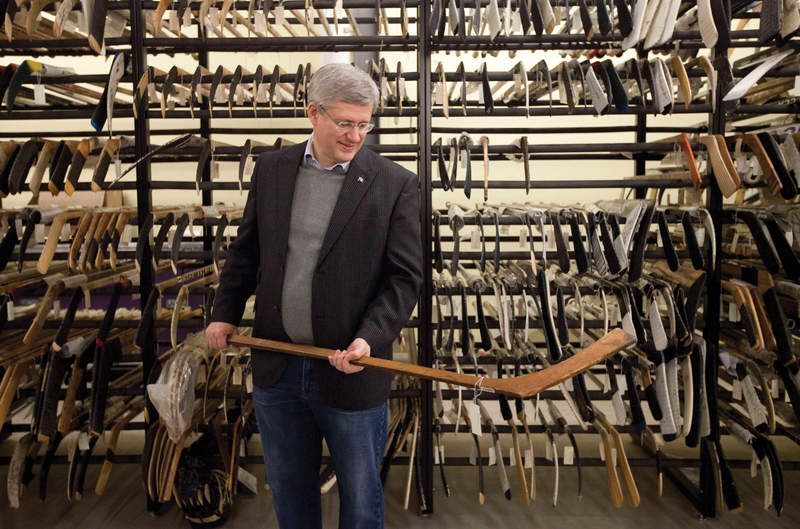 The Prime Minister famously has a hockey room upstairs at 24 Sussex Drive. That’s where he keeps his Vladislav Tretiak sweater, and the other one that all those 1967 Maple Leafs signed for him. My guess is that they won’t be found be floating in the Ottawa River until fairly late in the campaign — that’s more of a final gesture. First, I think Mr. Harper will stand to advise the House that back in February, when he phoned Mike Babcock in Sochi, it was not to congratulate him on Canada’s golden effort on the ice, but rather to warn him that any attempt by a sitting coach to contact him would be inadvisable and inappropriate, as well as to demand his immediate resignation. I’m not saying any of this is going to be easy for Mr. Harper. Hockey has come under attack before, by environmentalists and other radicals, members of the media party, Swedes, with their shrill cries for more helmets or fewer fists to faces. Each time, hockey has stood up, resisted. Why should it bow now? Maybe it won’t. All I’m saying is that Mr. Harper is nothing if not a formidable foe. If hockey has met its match, we’ll know soon: as the Kyoto Protocol will tell you, he likes to move fast when he’s on the attack. No doubt he’d prefer to have it all wrapped up before Parliament rises for the summer. That would clear the way for the government’s fall agenda, and whatever new earth might need to be scorched then. I have no way of knowing, of course, what that might be, but I’d be ready, geography. Numerous atlases aren’t going to save you once the Prime Minister decides your time has come. You’ve been warned. ← colour your own espo!